Step-by-Step Recipes and Crafts for Kids to Make...and Sell! Burnt Cheese Press, 9780996911221, 128pp. Kids have been running lemonade stands for decades, whether to raise money for a new bike, for a charitable cause, or simply to conquer boredom. 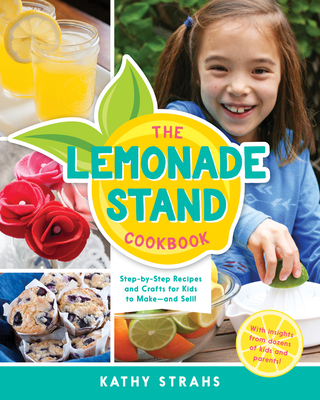 Inspired by dozens of kid experts from all over the country, the author has poured her expertise as a food writer, entrepreneur, and mother into the ultimate guide to setting up your own lemonade stand. Step-by-step illustrations and full-color photographs of each recipe and craft make each page easy and fun to dive into. Find delicious drinks, such as Classic Lemonade and Cold-Brew Iced Tea, sweet treats such as Polka Dot Blondies and Chocolate-Dipped Marshmallows, grab-and-go snacks such as Owen’s Cheddar Chompers and Sunflower Crunch Balls, and creative crafts such as Hayley’s Flower Pencils and Friendship Bracelets. Tips for setting up a successful stand, packaging ideas, cooking technique tutorials, and real-life stand stories from kids themselves are sure to inspire readers to give life a squeeze. Kathy Strahs is the voice behind the blogs Panini Happy and Cooking on the Side. She is the author of The 8 x 8 Cookbook and The Ultimate Panini Press Cookbook. She lives in Los Gatos, California.